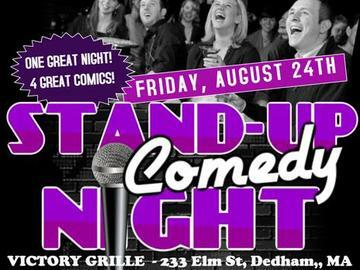 WWLI-FM-Lite Rock 105 Morning Radio Host Stephen Donovan host a night of stand-up comedy at Victory Grill in Dedham, MA with national headliner from NBC's Family Feud & Nickelodeon's NickMom's Night Out... Corey Manning. Also featuring from Kevin Hart's Hart of the City on Comedy Central, J. Smitty. Take a seat and put your drinks/food in a location where you're less likely to knock them over, because as soon as Corey Manning descends upon the stage... It's on!!! If there is no energy in the room, he brings it. If there IS energy in the room, Corey absorbs it, electrifies it and then takes it to another level. Fresh off his performance in Tracy Morgan's return to comedy "Picking Up The Pieces Tour", Corey was a featured comedian on season one of Nick Jr.’s NickMom Night Out Comedy Showcase, appeared on NBC's FAMILY FUED with Steve Harvey, and has a comedic resume that includes performances in Jamie Foxx's LAFFAPALOOZA's New Faces In Comedy. Corey is known for his "Slick, upbeat, funny, over-the-top comedy." So if you're ready for a laugh of a lifetime, call Corey Manning to your rescue. He is your Comedian By Night. Superhero By Day.